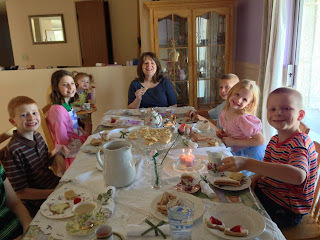 Gabe's babes: Tea with Nana! My mom came out for a quick visit last week-end. I was still down with morning sickness, but starting to come out of it. 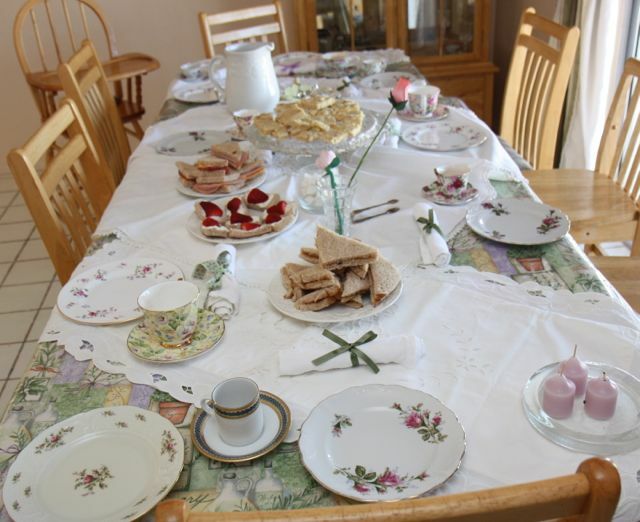 When the girls heard that Nana would be visiting they set to work right away planning a tea party. 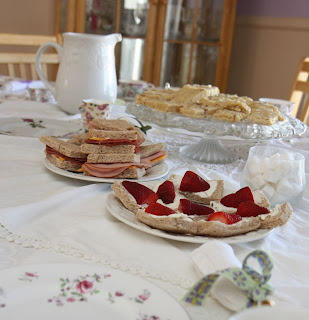 They planned the menu of scones, tea sandwiches, fruit, raspberry lemonade and tea. They pulled out and ironed the tea linens and Miss E even tied all of the napkins with beautiful bows. They all worked to set the table. It looked quite lovely. Once it was all set up the girls even dressed up for our tea party. The boys were invited to this party. We all had a great time. I'm so blessed to have such hard working, thoughtful, and capable girls. They pulled this off with very little help from me, and blessed our whole family. Good job girls!